Congress’ minimum income guarantee can stop the continuing decline of India’s poor. Wiping every tear from every eye” is the opening sentence of the chapter on Universal Basic Income (UBI) in the Economic Survey of FY2017, authored by Dr Arvind Subramanian, the former Chief Economic Adviser of India. 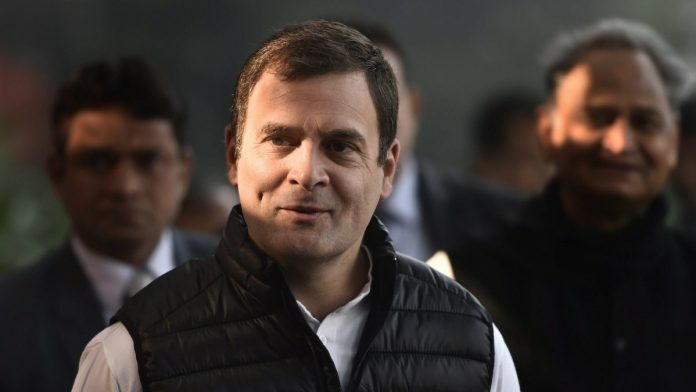 On Monday, Congress president Rahul Gandhi announced the promise of a ‘minimum income guarantee’ for every poor Indian household, sans the melodrama of ‘wiping away tears’. The idea of a basic income is so powerful that it has even lured otherwise drab economists to melodramatic descriptions of an economic policy. Why? The simple idea behind a basic income for every citizen is that, in a just and humane society, every family must be entitled to some minimum income, without prejudice. Universal basic income or minimum income guarantee or just basic income is a policy idea that has been widely debated and discussed in recent times across the world. It is also one of the rare ideas that is acceptable across the economic ideological spectrum from the extreme Left to the extreme Right. The Left likes it for its egalitarianism and the Right likes it for its efficiency. Perhaps no nation in the world needs this more than India and at no better time than now. The Indian economy has been devastated with the self-inflicted twin shocks of demonetisation and GST. Rural distress is widespread. Real income growth has been moribund. Jobs and hence, incomes, for youth are scarce. Liquidity crisis caused by demonetisation turned into a solvency crisis for many small businesses. The yawning gap between the rich and the poor is widening. It is thus time to remonetise the economy. It is time to stop the continuing decline for millions of India’s poor. It is time to put money in people’s hands. A minimum income guarantee scheme can do exactly this. This is the promise of the Congress president to India’s poor. This idea has been actively discussed and debated within the Congress party for some time now. The manifesto committee chaired by former finance minister P. Chidambaram has held various meetings with stakeholders over the past several weeks. There is understandable curiosity about the scheme and its details after the announcement by Rahul Gandhi. The Congress party’s minimum income guarantee scheme will be an Indian adaptation of the universal basic income idea as mooted by economists. It will not be universal, i.e. it will not be for everybody. It will also not be a standard income for everyone. It will be a progressive scheme. The idea is that every family in India must be entitled to a certain basic minimum income that can be determined through a combination of factors such as per capita income, cost of living, inflation etc. The number of households that fall below this basic minimum income threshold can be imputed through economic Census surveys. The amount of income support offered for these families will then vary depending on their income distance from the minimum income threshold. This is broadly how a progressive minimum income guarantee scheme can be structured. The exact details of the structure of this scheme, the minimum income threshold amount, the number of beneficiary families are being worked out and will be detailed in the Congress party’s manifesto, to be released soon. There is the other big question of how this scheme will be funded. The Congress party is acutely aware of the importance and the need for fiscal discipline. Hence, fiscal restraint will be adhered to. It is our belief that the scheme can be adequately funded through a combination of increased revenue (not necessarily higher taxes) and rationalisation of expenditure. Let us also not forget that with oil prices at stable lows, this is also the most favourable macroeconomic window to embark on this idea. It is equally important to note that income in the hands of a large number of people provides an immediate boost to consumption and the overall economy. There is much speculation (and desire on the part of self-styled libertarians) that the introduction of a minimum income guarantee scheme will mean abandoning other subsidies and welfare programmes. This is again being too simplistic. Subsidy and welfare schemes are of various kinds – cash schemes, in-kind schemes, merit subsidies, de-merit subsidies, etc. Clearly, some schemes are working well and some are not meeting the intended objectives. Hence, the need for rationalisation of expenditure rather than a carte blanche rule to do away with all welfare programmes. It must also be noted that any transition to a new policy regime will need to be carefully done and given sufficient time to smoothen the process. Next, economic commentators agonise over how we can we target poor households and measure the distance from the minimum income threshold. Admittedly, this is the most difficult part. But that does not mean it is impossible. Using big data and technology, it is much easier to identify households by income distribution today than it was even five years ago. ‘It has not been done before’ cannot be a lazy excuse for not embarking on this idea when the nation needs it the most. Overall, let us recognise that India’s poor are slipping rapidly into an abyss. Headline economic growth has been devoid of jobs, incomes and livelihoods for the needy. Existing social welfare programmes are patchy and inefficient. The advent of technology is only threatening to further exacerbate the gap between the haves and the have-nots. Hundreds of millions of Indians are at the risk of being left behind. The minimum income guarantee scheme is the equivalent of India’s ‘No Indian Left Behind’ Act. The author is the Chairperson of the Data Analytics Department of the Congress party and a former political economist. Congress has never been able to tackle this problem..And will never be able to. It’s only a political gimmick and can never be a policy because they will again get into the buisness of building their wealth than empowering the poor. Yours is just an opinion Revati. Now look at your favourite political party – have they one original economic idea or scheme which is not a renamed or reworded congress scheme?no. It’s an utterly unoriginal and unimaginative party from an economic standpoint with no no real alleviation of the poor or the middle class. Considering the last 5 years, there are enough Indians who are willing to give the Congress a chance. “Considering the last 5 years, there are enough Indians who are willing to give the Congress a chance.” – That’s just your opinion Ajay JI. Wait and watch how Congress and its miserable coalition partners will cause anarchy, if they manage to win at all because the Prince that you so much love will never become the PM because of his measly electoral gains and also because he would rather enjoy his overseas trips as MP than wear the thorny crown of the PM of this great country.